Thursday, May 15, 2003... This morning I turned around and headed south, after first looping north of the Bay Area through Napa and Sonoma Counties -- wine country. Passing through the town of Fairfield, I saw several signs for "Historic US 40" -- more evidence of progress by the relative handful of highway historians. Such historians would note that US 101 has been re-routed several times north and south of San Francisco. North of town, it often veers off the freeway version of 101 as a street called "Redwood Highway." South of San Francisco, what's currently identified as US 101 is a wider, rebuilt version of what used to be called US 101 Bypass, with the original 101 renumbered State Route 82. Route 82, in turn, is named El Camino Real -- the Royal Road built by the Spanish 200 years ago to connect their California missions. 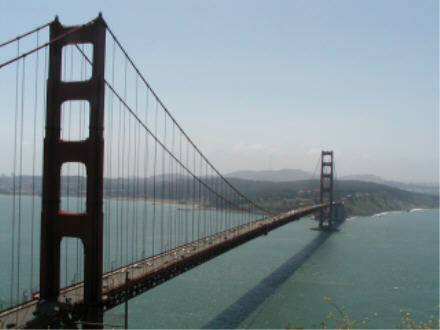 Between the Redwood Highway and El Camino Real sits the Golden Gate. The best views of the bridge, and the city of San Francisco, come from the overlooks west of the Golden Gate Bridge on the north side. After crossing the bridge, I detoured several miles west for a new Lincoln Highway marker: a cement post labeled "Western Terminus of the Lincoln Highway," erected last year in the parking lot of the Palace of Fine Arts, the Lincoln's western terminus. Alas, nothing similar exists on the eastern end, in Times Square. 101 still follows local streets in much of San Francisco. After clearing the Golden Gate Bridge and environs 101 follows Lombard Street east past dozens of local and chain motels, turning south on Van Ness just before Lombard Street climbs the steep hill whose twisting, turning descent has been immoitalized on millions of San Francisco postcards. It passes through the civic center before becoming a freeway. I followed El Camino Real from the San Francisco line south to Santa Clara, then doubled back north on I-280. 280 is about five miles west of 101, with a steep ridge in between -- it's like another world. 101 is built up; 280 remains hilly, rural and scenic. Driving back to San Francisco, I made better time than I had anticipated, reaching the neighborhood of Pacific Bell Park an hour before game time. Pac Bell Park is Bud Selig's worst nightmare: proof that a modern ballpark can be built without the nine-figure public subsidies he and his cohorts demand. 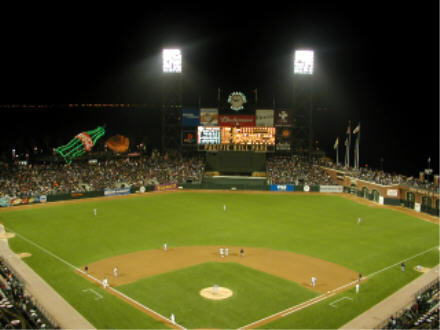 Pac Bell doesn't have a retractable roof, or acres of team-controlled parking in the neighborhood, but the Giants are more profitable than many clubs which demanded and received free stadia. Certainly more profitable than tonight's opponents, the Mets, whose knack for signing and trading for high-salaried veterans on the decline may produce a second straight last-place season. Tonight I'm staying with John, a fellow Met fan and a friend from college who winced along with me tonight. John's also my only acquaintance ever to edit a hymnal, a distinction I don't see him losing anytime soon. Tomorrow I head down toeard Los Angeles, and sometime Saturday I reach the Mexican border before turning north. Later! P.S. : R.I.P., June Carter Cash. Who would ever have imagined her husband would outlive her?